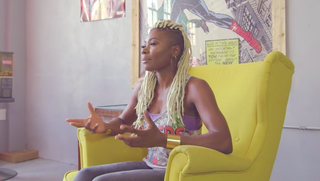 Ariell Johnson made history in 2015 with her Amalgam Comics & Coffeehouse, becoming the first black woman to open a comics shop on the East Coast. Now, with the help of a $50,000 grant from the Knight Foundation, Johnson has her sights set on changing the comics industry from the ground up. Johnson initially opened Amalgam in order to bring her Philadelphia neighborhood an inclusive shop where fans from all backgrounds could feel comfortable hanging out and reading and buying comics. In her award-winning proposal “Up, Up and Away: Building a Programming Space at Amalgam Comics & Coffeehouse,” Johnson laid out her vision for Amalgam’s future as a place where creators interested in breaking into the comics industry could hone their craft. In addition to mainstream comics, Amalgam also sells self-published work. In an interview with Philly.com, Johnson explained that while she’s passionate about creator-owned titles, she often sees work that isn’t quite ready to be sold commercially. Amalgam University, the program she plans on launching with the grant money, will focus on helping new creators take their work to the next level. “Often, the ideas are there, but they haven’t studied the craft,” Johnson explained. “It’s a comic book, but it’s also literature. Just like there are good writers of literature, there are good writers and illustrators of comic books.” As part of her new initiative, Johnson also plans to expand Amalgam’s physical space to better accommodate events and workshops within the store.